Strategies on how to find THE words that will save you time, money and make you succeed globally. secure an advantage and communicate worldwide using surprisingly simple strategies. Laugh & learn! Insights that will change your business. The best training course I've ever participated in. A totally new approach: More open, inspiring, customer oriented, effective and enjoyable. I have started to think in English!" These are just a few of the comments we received from our colleagues about The English Code and Ms. Kilian. Excellent success-focussed training based on an efficient and unique concept! Susanne Kilian's keynote was fascinating and very entertaining at the same time. It provided us with surprising and rich insights with regards to international communication. Even though most of us were convinced to speak English at an nearly-to-native level, we definitely learned a lot. Do you know my book? 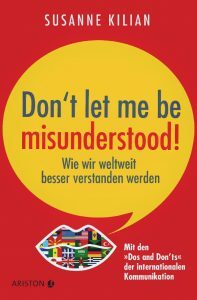 Wie wir weltweit besser verstanden werden - Mit den „Dos und Don’ts“ der internationalen Kommunikation.